STRONGROOM is pleased to present Sympathetic Magic, a collaborative site-specific installation by Kyle Combs and Justin Davis Anderson at 200 Grand Street, Newburgh, New York. 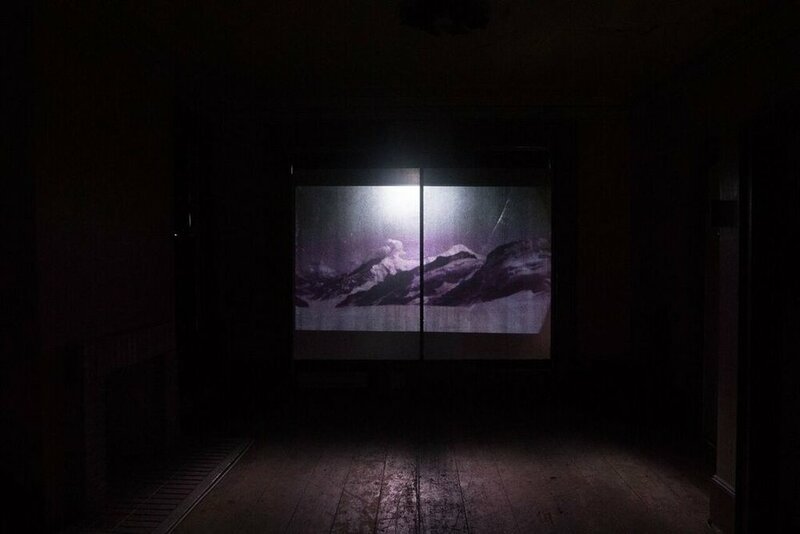 Using a vacant 1890s row house in the City of Newburgh as their canvas, the artists have created an immersive environment of sound and projections on the parlor floor. Kyle’s steel plates connecting ceiling and floor act both as transactors of sounds tuned directly to the material, and also as screens for Justin’s abstract projections depicting brightly painted film. Through their intervention in the space, the artists address the sympathetic relationship between material, form, content, and architecture, as well as the notion of “sympathetic magic,” in which two objects that come in contact are, on some level, forever intertwined. In this way, they respond to this long-empty domestic space with their sympathetic relationship both as artists in collaboration, and as contributors to the building’s history and future history. On the second floor of the building, Kyle and Justin will also each present an individual site-specific artwork. Justin Davis Anderson is a visual artist living and working in New York. He has shown in NY, LA, Chicago and Atlanta in the states and abroad in London. Kyle Combs is a New York based artist and composer whose work investigates the intersection between sound, sculpture, architecture, music, and material. Kyle is also a member of several music ensembles such as Luscious Skin, Axsys, and Fragile. This exhibition was made possible with the generous support of Paula Dowd and Julie Lindell. Thank you!